When I arrive in a new city the first thing I like to do is explore my neighborhood. Staying at the Ambassador East gave me plenty to explore. My first objective was to see the lake. I walked down Goethe street to find that in order to cross Lake Shore Drive I had to walk several blocks south to a tunnel that passed under the highway and came out right by Oak Street Beach. For those of us who pine every year we are away from the clear blue waters of the Aegean, Lake Michigan on a sunny summer day looks surprisingly similar, not only from the air but even up close. It smells different of course because it is fresh water, not salt water, but it looks just as clean and clear as some of my favorite beaches in Greece. In the summer the activity level on the shore of the lake is electrifying. Besides the hundreds of people in the sand and sea there is an army of walkers, runners, joggers, bikers, rickshawers, wheelchairers, using the paved pedestrian avenue that hugs the shore and connects the beaches, parks and green areas. If you enjoy walking then Chicago in the summer is a paradise. Actually if you don't enjoy walking and would rather sit on the beach and drink beer and watch girls it is a paradise too. And as I stood in the water and looked at the tall buildings that lined the coast I wondered how cool it would have been to have grown up here. My walk took me to Navy Pier, 50 acres of parks, promenades, gardens, shops, eateries and attractions jutting out into Lake Michigan. It is like a giant mall, packed with tourists and locals in the summer. Navy Pier is the Midwest's #1 tourist and leisure destination, attracting more than 8.6 million visitors a year and it felt like they all came on the day I was there because of the Tall Ships that were visiting that week. Even when the tall ships are not in town there are a number of cruises which leave from the pier that explore the lake and the Chicago river. Tall Ship Windy is Navy Pier's resident 148-foot, four-masted schooner. Several 90-minute cruises, as well as charter and educational trips, are offered each day. Seadogs I, II, and IV offer exhilarating 30-minute Lakefront Speedboat Rides and amusing 75-minute River Architectural Tours on large and loud speedboats. 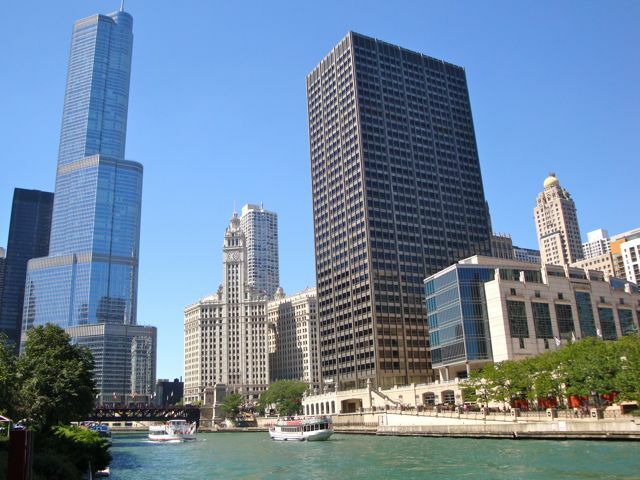 Shoreline Sightseeing and Architecture Cruises offer 30-minute Skyline Lake Tours and one-hour Architecture Cruises with experienced, entertaining guides who show you the masterpieces of modern architecture on the Chicago River. There are also several lunch and dinner cruises on luxurious modern yachts like The Odyssey, Spirit of Chicago and Mystic Blue. On the pier itself are restaurants and shops and an indoor arboritum, rides, exhibits and all sorts of stuff of interest to kids and adults. Of course being the walking type I passed the lines waiting for the next river cruise departure and walked up the Chicago River instead. There is a lovely path along the bank of the river with grass, trees and flowers and even several cafes and restaurants, a narrow park beneath the towering skyscrapers of downtown Chicago. This is truly one of the best walks in America for those who love cities and especially those who love river traffic. There is no end to the number of excursion and private boats and if you walk at the right pace you can actually listen to the tourguides as they explain the architecture to the passengers. The water is a beautiful turqouise color, not quite the Carribean but certainly different from what I am used to in the central North Carolina rivers which are usually the color of mud. I continued to walk up the river until I came to the bridge at Clark Street and from there walked back to the hotel. That's one of the best things about visiting a city. You can walk for hours and hours and not realize it until the next day when you are sore as hell and can barely get out of bed without a triple espresso and 800 mgs of Ibuprofin. From the Ambassador East on the Gold Coast to Navy Pier and up the river and then back to the Ambassador East must be about ten miles at least. And did I mention I was wearing flip-flops? 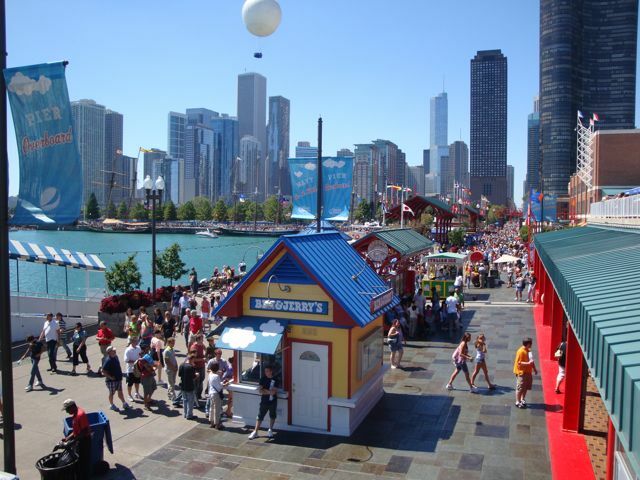 For those who want to continue walking south from Navy Pier past the entrance to the Chicago River you will come first to Millenium Park, a lively, spectacular gathering spot located in the heart of the city which covers the north section of Grant Park. With the city as a backdrop and Chicago Harbor in front Millenium Park is actually the roof of a giant parking garage. The Pritzker Pavilion is Grant Park's outdoor performing arts venue for small events, is the home of the Grant Park Symphony Orchestra and Chorus and the Grant Park Music Festival, and is built on top of the Harris Theater for Music and Dance, the park's indoor performing arts venue. The AT&T Plaza is a public space that hosts the Cloud Gate sculpture a three-story steel sculpture that has been dubbed "The Bean" by Chicagoans which was supposed to cost $6 million and ended up costing $23 million. Those of us who were present during the construction for the Athens 2004 Olympics know that these things 'happen'. Crown Fountain is an interactive work of public art and video sculpture designed by Catalan conceptual artist Jaume Plensa. It is composed of a black granite reflecting pool placed between a pair of transparent glass brick towers 50 feet tall. Construction and design of the Crown Fountain cost $17 million. The Lurie Garden is a 2.5-acre public garden at the southern end of Millennium Park which cost $13.2 million and has a $10 million financial endowment for maintenance and upkeep. The McCormick Tribune Plaza & Ice Rink is a multipurpose venue located along the western edge of Millennium Park. From November through March it operates as McCormick Tribune Ice Rink, a free public outdoor ice skating rink. For the rest of the year, it serves as The Plaza at Park Grill or Park Grill Plaza, a 150-seat outdoor restaurant that offers scenic views of the park, and hosts various culinary events and musical performances. The BP Pedestrian Bridge connects Millenium Park with Daley Bicentennial Plaza which features tennis courts, chess tables, and a miniature golf course. The Joan W. and Irving B. Harris Theater for Music and Dance is a 1525-seat theater for the performing arts located along the northern edge of Millennium Park. Constructed partially underground in 2002�03, it is Chicago's premier performance venue for small- and medium-sized performance groups. Wrigley Square is a public square located in the northwest corner of Millennium Park near the intersection of East Randolph Street and North Michigan, and contains the Millennium Monument, a nearly full-sized replica of the semicircle of paired Greek Doric-style columns (called a peristyle) that originally sat in this area of Grant Park between 1917 and 1953. The McDonald's Cycle Center is a 300-space heated and air conditioned indoor bike station located in the northeast corner of Millennium Park that provides lockers, showers, a snack bar bike repair, bike rental and other amenities for downtown bicycle commuters and utility cyclists as well as runners and in-line skaters. While there is no denying that Millenium Park offers Chicagoans an outdoor area that would make any American city envious as well as providing parking, the cost of this project has brought some criticism. But you have to out it all in perspective. $13 million for Lurie Garden and $23 million for Cloud Gate seems like money well spent when you consider that the Department of Homeland Security spent $52 million for survelience cameras on the top of Crown Fountain and around Millenium Park. But on the positive side the park was designed to be fully accessible won its project director the 2005 Barrier-Free America Award and The Financial Times describes Millennium Park as "an extraordinary public park that is set to create new iconic images of the city... a genuinely 21st-century interactive park that could trigger a new way of thinking about public outdoor spaces". 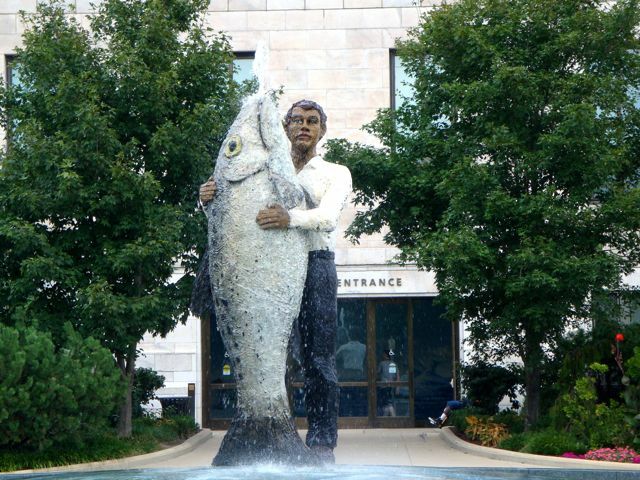 Further south Chicago's Museum Campus is the site of three of the city's most notable museums, all dedicated to the natural sciences: Adler Planetarium, Field Museum of Natural History, and Shedd Aquarium. Nearby is Soldier Field, home of the Chicago Bears. It was designed in 1919 and completed in the 1920s with impressive doric columns that became less so when its recent rennovations made it look like the architectural wedding of Greek neo-classic architecture and the spacecraft in Close Encounters of the Third Kind. Though Chicago Tribune architecture critic Blair Kamin dubbed it the "Eyesore on the Lake Shore" I think it looks pretty impressive. The Long Count Fight, the second heavyweight championship bout between Jack Dempsey and Gene Tunney, was held at Soldier Field on September 22, 1927. The Rolling Stones, Bruce Springsteen, Paul McCartney, The Grateful Dead, Madonna, Pink Floyd and U2 have all played here and 60,000 people came to hear Dr. Martin Luther King as well as Mahalia Jackson, Stevie Wonder, and Peter Paul and Mary in 1966. Even with over 60,000 seats, Soldier Field is the smallest stadium in the NFL. 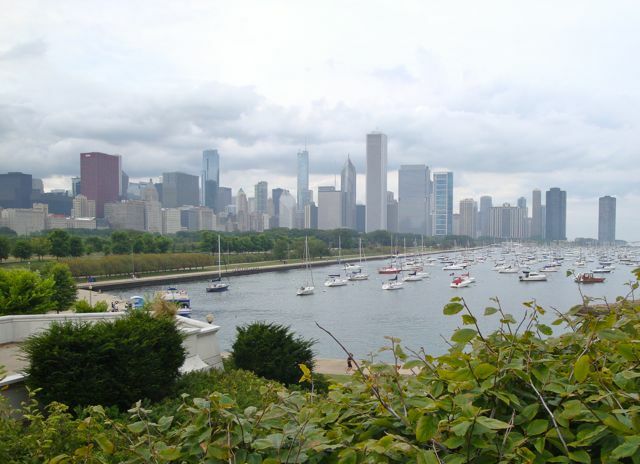 North of downtown on the lake is another large green area called Lincoln Park which contains the Lincoln Park Zoo, Lincoln Park Conservatory, an outdoor theatre, a rowing canal, the Chicago History Museum, the Peggy Notebaert Nature Museum, ponds, playing fields, many statues, and right across Lake Shore Drive is North Avenue Beach. It is also famous for the 1968 battles between Chicago police and Yippies who had come to stage a Festival of Life as a sort of antidote to the Democratic National Convention which was being held at the Chicago Civic Center. Though thousands of young people came to Chicago to hear some of their favorite bands at a free concert, in truth the city had denied the permits and the only acts to show up were the MC5 and protest singer Phil Ochs. What followed was several days of street fighting and battles in the park between young people and Richard Daly's Chicago police, while inside the Civic Center, which was protected by armies of cops, barricades and barbed wire, the Democrats nominated Hubert Humphry as their candidate to take on Republican Richard Nixon. A third-party candidate, a pig named Pigasus, chosen by Abbie Hoffman and Jerry Rubin and not considered to be a factor in the upcoming election, was arrested with its owners who were charged with disorderly conduct. Meanwhile camera crews from all over the world who had come to cover the convention found more exciting footage outside as police beat and clubbed young demonstrators in what was called a 'police riot', and these images were seen in every household in America and many around the world. 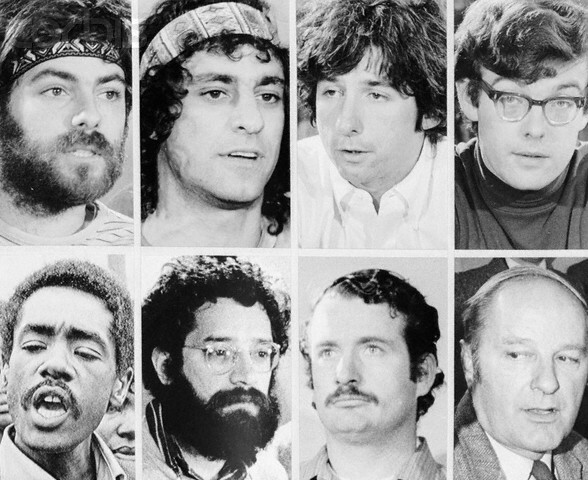 Eight activists, Abbie Hoffman, Jerry Rubin, David Dellinger, Tom Hayden, Rennie Davis, John Froines, Lee Weiner and Black Panther Bobby Seale were charged with inciting the riots. When Seale's lawyer became ill Judge Julius Hoffman would not allow him to defend himself. Seale continued to interrupt the proceedings demanding he be allowed to defend himself until the judge ordered him gagged and tied to a chair. This became an iconic image but still did not keep Seale quiet. Finally Judge Hoffman charged him with contempt of court, sentenced him to 4 years in prison, and the remaining defendants would go down in history as the Chicago 7. Two were acquitted completely, while the remaining five were convicted of crossing state lines with the intent to incite a riot fined $5,000 and sentenced to five years in prison. All of the convictions were reversed by the United States Court of Appeals for the Seventh Circuit. The Justice Department decided not to retry the case. The community of Lincoln Park which borders the park is a neighborhood of young urban professionals, recent college graduates, and young families. The neighborhood contains boutiques, bookstores, restaurants and coffee shops and many bars and clubs in the area, especially along Lincoln Avenue between Wrightwood and Webster. It is also one of the most expensive neighborhoods to live. If you are in Chicago and the Cubs are in town then a trip to Wrigley Field is a must. One of the last of the old style ballparks, there are no flashing billboards or video replays on giant screens, or loud blaring rock music. Wrigley Field is about pure baseball, mostly losing baseball, but that should not matter if you are not a Cubs fan. You can do what I did and plan your trip for when your favorite team is in town and chances are good you will see them win. The neighborhood around Wrigley field is full of sports bars, restaurants, pizza joints and interesting shops, not all related to sports and baseball. There is a carnival-like atmosphere here before and after games and there is still a tradition of playing day games even though the stadium now has lights. Don't forget to take the elevator to the top of what used to be called Sears Tower but is now called Willis Tower. The Skydeck has the most spectacular views west of the Empire State Building, and a glass ledge that you can stand on if you are feeling brave. There is also a wall with a history of Chicago and maps that tell you what you are seeing. It is open 365 days of the year so try to go on a clear sunny day if you can. It's at 233 S. Wacker Dr. and you enter Skydeck on Jackson Blvd. (south side of building). When you are finished cross the river and walk 5 blocks up Jackson and go to Greektown for lunch and visit the Hellenic Museum. If you are staying at the Ambassador East be sure to check out the Division Street Farmers Market right down the street from the hotel. Not that you will be doing much cooking in your room but there are lots of interesting stands and it is nice to be able to compare farmers markets from other cities. It is open on Saturdays from 7am to 1pm from May 15 to October 30. There are lots of other farmer's markets scattered around Chicago and the suburbs. 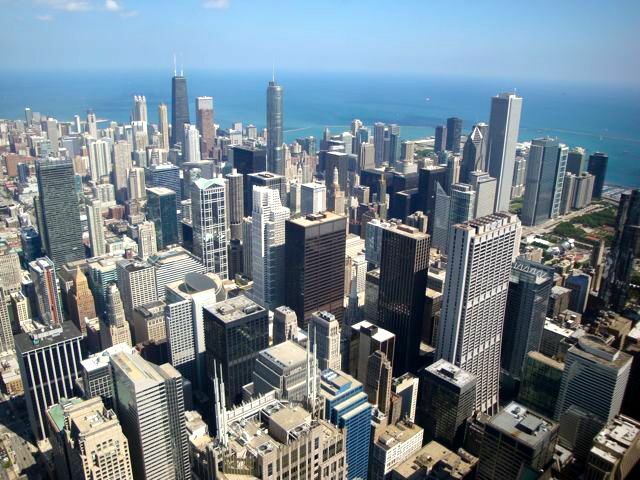 Also there is Chicago�s Downtown Farmstand, located at 66 East Randolph Street which features hundreds of products, all from within 250 miles of Chicago. Each day, a wide range of dairy products, condiments, seasonings, preserves, breakfast favorites, baked goods, and other items can be found here and lunchtime programs on Wednesdays and Fridays feature cooking demonstrations of easy-to-make recipes using what is newest and freshest that day, or tastings of specialties from local food artisans. If you come to Chicago in the winter probably the thing you will want to do more than anything is stay warm. 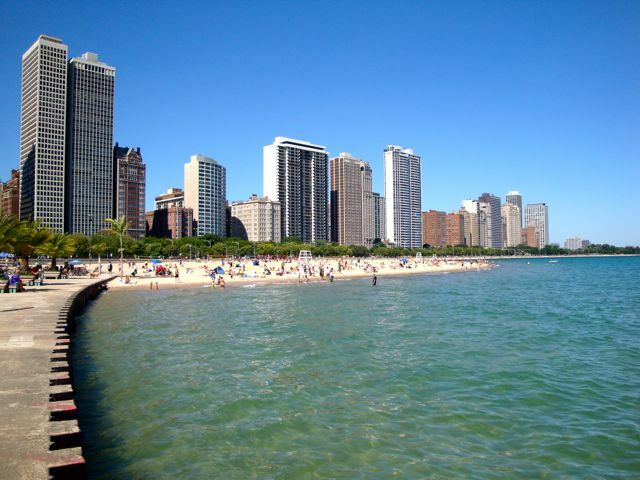 When you are in Chicago in the spring, summer and early fall it is easy to be seduced by the beauty of the city, the lake, the gardens and lawns, and the people strolling through the neighborhoods. However when you talk to anyone who has lived in Chicago about the beauty of the city there is usually a "Yes but...." followed by a description of how brutal the winters can be with snowdrifts covering cars and icy winds coming off the lake. So if you come to Chicago during the cold winter months the choices of things to do are easy: anything that enables you to spend as little time as possible outdoors. You can go out to dinner, go to the movies, go to clubs, bars, go watch the Chicago Bulls. Those hearty fans of American football can go to see the Chicago Bears and snuggle up to whoever they are sitting next to. But maybe you are coming from somewhere that is even colder than Chicago, like North Dakota or Jeaneau, Alaska or Scandinavia or Greenland or the South Pole. Maybe you are not bothered by the cold. Maybe you like it. In this case there is free Ice-skating in Millennium Park.The McCormick Tribune ice rink at Millennium Park is open from noon to 8pm from late-November through mid-March on weekdays and longer on weekends. Wrigley Field maintains an ice skating rink right outside the stadium in the winter which is probably not as crowed as the Millennium Park rink. For foodies Chicago�s annual Restaurant Week takes place every year in late February when top restaurants from around the city design special three-course lunch and dinner menus priced at $22 for lunch and $32 for dinner to draw winter weary Chicagoans out of their homes. Most of Chicago�s museums including Shedd Aquarium, Field Museum, Art Institute and Museum of Science and Industry offer free museum days throughout the months of January and February probably for the same reason. The Lincoln Park Zoo, the largest free zoo in the US, is open year round and in the winter from late November to early January, hosts Zoo Lights when the zoo stays open late and is decorated with beautiful light displays making the animals wonder what these crazy humans are up to now. And of course if you come during the Christmas Holidays the downtown is lit with Christmas lights and Chicagoans brave the cold, some of them even pausing to look at displays in department store windows for a few moments before their feet get frozen to the pavement. The Museum of Science and Industry hosts their Christmas Around the World and Holiday of Light with a 45-foot Grand Tree in the Rotunda with more than 30,000 lights and 1,000 ornaments, surrounded by more than 50 smaller trees beautifully decorated by volunteers from Chicago�s ethnic communities to represent their various cultures and holiday traditions.